Hi guys, new guy to the forum, a big early car fan and have collected a few cars over the years. I hope to be able to offer something to the site and learn some more stuff along the way. Are you E21Mark from PH? Hi Dan, no that's Mark Brown with a red E30 M3 and a loooong history of early stuff. We both hail from sunny Cornwall though I'm mark.c on PH. Hello and a very warm welcome, that makes three of us with black e12 M535i's, yours look in great condition. Thanks guys. I plan to do some work to the E12 in the near future, it's got 50k on the clock and is largely untouched but I definitely feel there is a lack of newness in the suspension department, it's on its original dampers as far as I know and the comedy lurch under full throttle would back this up!! looking about most owners seem to rate H and R springs and b6 billies as a sensible replacement , is that still the current thinking? I do want to lower the car slightly and replace the dampers but don't want to go down the coil over route, I've certainly nothing against that but I don't feel it's right for this car. My concern with the H and R's is traditionally these would be matched to shorter stroke b8's but these aren't available as far as I can find for the E12? What are you guys running and how do you find the set up, I appreciate it's never going to handle like an E30 M3 but with my tired old shocks I'm sure there is room for improvement ! Thanks for the welcome and apologies for the questions straight of the bat! I am new to e12's, mine is undergoing full restoration, I am putting H&R springs into the front and H&R rear with one coil cut in the rear, as standard it sits too high at the back. This may or may not be temporary, depending on how well it works. I am an e28 man really, both my e28 M5 (now sold) and my 528i have custom made springs by Faulkner Springs, based over in the Fontwell/Bognor area. I have found that the problem with using "off the shelf" springs such as H&R is that you have no idea what the spring rates are. The e28 M5 was set up purely for track use and it was awesome, on the road it would have been undriveable. My modified 528i is running Faulkner custom springs made up to Hartge spec, Faulkners would be worth you investigating IMO, they will require lots of information from you, free length, internal and external diameters and your existing spring rates, which they test. Good luck which ever route you choose, for the record I whole heartedly agree with you about coil overs. Edit: IMO B6 are fine but if you go too low you will need shorter shocks. Thanks Jam, all of that makes sense. I think for now I will get a set of H and R springs and some b6 dampers and see how it works. I did find some info online that confirms what you have mentioned, that b6's are within range/stroke with a 40mm drop but any further will require shortening, this can be requested at the time of order if there isn't a b8 available as is the case with the E12. I will look to see how the rear sits, I believe there are two positions on the rear strut to sit the spring perch so that may give a bit of adjustment as it where, although I think if using the lower perch then a slightly thicker Spring pad needs to be used to prevent the spring sitting loose under extension. God luck with your E12 restoration....how bad is it? Any pics or have I missed a thread somewhere ? ETA, I've just found your build! I discussed as length with Tony about that car, that and the Henna car he had at the same time before I bought mine. I tried to coerce my Dad into asking Tony to restore it as a retirement project for him! It's great to see it being saved. Car looks great, welcome aboard. Welcome t the forum. Be good to have another active E12 member. Welcome! As already said, car looks great! I went for GAZ coilovers so that I could determine the ride height and choose the poundage of the springs. That said I might be selling them soon! Look forward to seeing more of this e12. Thanks lads, I'm just compiling my list of shiny stuff to buy at the moment, family commitments mean that nothing is happening fast though. I did however manage to grab some natty little Alpina B7s rear arch spats for the car, my reasoning is I would like to put a set of 7x14 BBS Mahle on the car with the new suspension, anyone have a set lying around??. i have bought some M stripes for the car too ( the small version) to break up the outside. I'm hoping that with a little drop, slightly wider rims and the decals it should look lovely. I'm not going to do anything that isn't OEM ish or irreversible. One question though, what are you guys doing for exhausts, mine is currently on its original 3 box system, I'm tempted to remove the middle box to give it a little more voice, I don't want to go mad or ruin the car in anyway but a little bit extra in a few areas I hope will only enhance an already lovely car ? 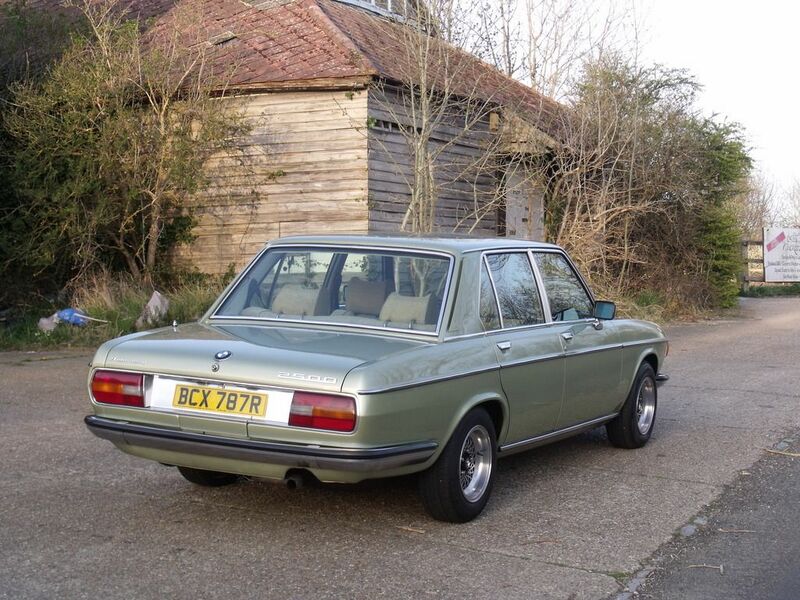 On my modified e28 528i and on the m5 that is now sold I have the Fritz 6 branch and full stainless exhaust, I have decided not to do this to the e12, a) Money, knocking on the door of £1400 and 2) I think I am getting old it is just too loud, especially on motorways, droning away so loud that you cant hear your "Now that's what I call music 2" cassette! From what I gather a genuine unmolested e12 M535i exhaust is a rare and expensive item, mine is a modified e28 item. Hi Jam, that E3 is a handsome car! I looked at a white one that Munich Legends had for sale a couple of years ago, I should have brought him home truth be told. Those wheels on the E3 are what I'm after, I want them in silver so very much in the same theme as what is already on the car but with just that added width, a set will come along I'm sure. I have bought a set of centre caps for an e21 with the Motorsport gunsight in anticipation so we will see what comes up. I hear what you're saying about the exhaust...there appears to be two types that the car could have come with, a two box or three box system with the rear box being the same item in both cases. I've been on to BMW and the two box system is still available. My front and middle box look ok, the rear is less than new and being OCD as I am I would like to replace it whatever I decide. That's why I thought just bypassing the middle box and putting a new rear box on would give an extra bit of voice without doing my head in ! My 320is has a carbon airbox/alpha n setup and that's loud enough for any man or household! Hi the wheels on the e3 are hand polished and the inside of the spokes painted black. The centre caps of yours are the same as mine and I think Walloth und Nesch sell the badges. How much are BMW asking for the two box system? Be very careful to retain the tail trims, they have the outwardly rolled ends and these are definitely NLA. I may have got the exhaust dit arse about face, the two box front section is NLA, the three box system is available. Off the top of my head the cost was something like 300, 450 and 380 for front, middle and rear respectively. Not what you might call a bargain but BM do know how to make exhausts in my experience. I noticed the the tailpipes were NLA, I did find a link to Pelican parts in the states that supplied them, I'll try and dig it out. 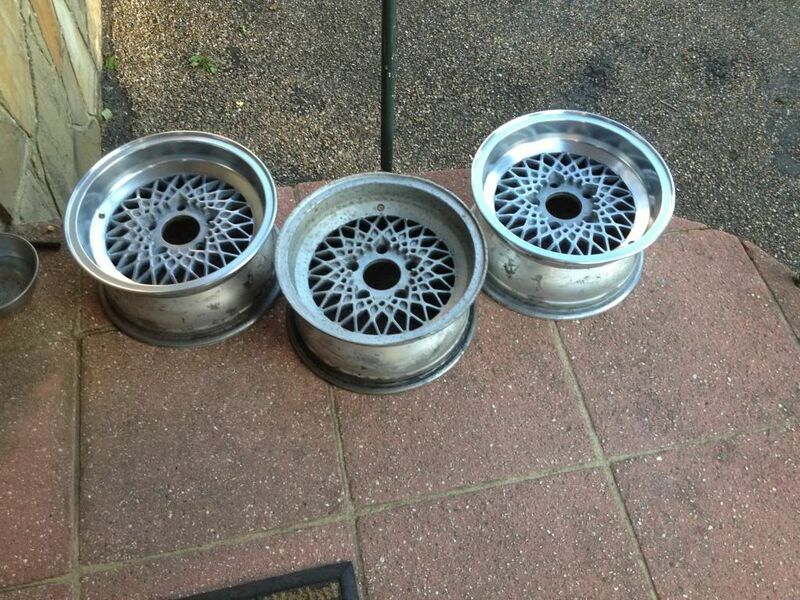 Well I've not managed to do much to the car of late but I did source a set of 7x14 et11 wheels from the go to guy TonyBMW. I thought I had missed the delivery but it turns out I needn't have worried since I left my car unlocked on the drive all day and the delivery driver put the wheels in the boot! Fair enough! 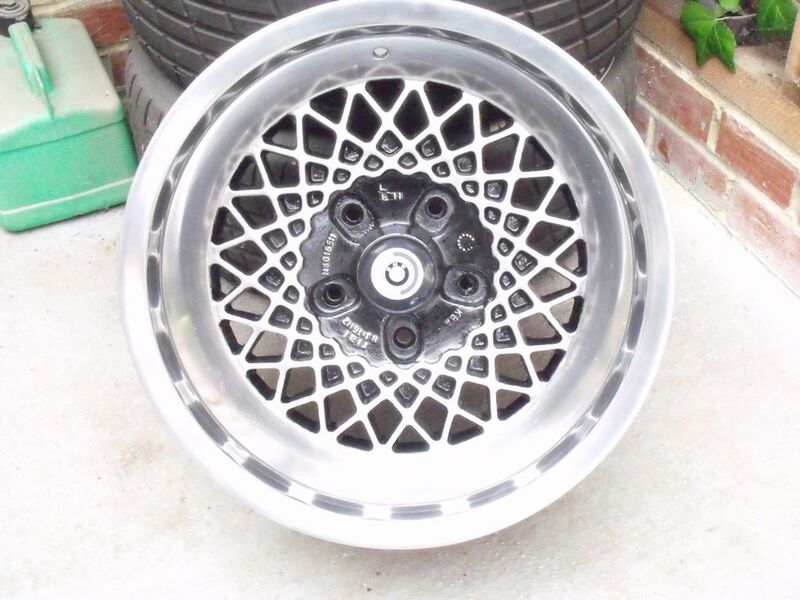 The wheels are straight and true but of course will need a refurb, I plan to dip them and then have them wet painted in the correct colour as OEM as opposed to powder coat in an attempt to keep the definition of the wording stamped on the rim etc. Anyone have a colour code? Anyway, it turns out my fancy new centre caps as shown further up the thread don't fit. They are about 60mm and fall straight through the centre of the wheel, a quick measure reveals I need about a 70mm cap instead. Has anyone got any of these kicking around that they would like to sell or a part number/lead on any ? Update, well as I mentioned in another thread, my delight at the new wheels was short lived as my fancy new centre caps didn't fit. So after much hunting I spotted a set on eBay in the States and all things being equal they should be winging their way to Cornwall as I type. I also spotted some NOS tail pipe trims, also in the States so bought them too. I'm still getting over the shock of how much all that lot cost including shipping. Defoe one I've kept from the misses! Next up on the list was to sort the exhaust...this is what my rear box looked like, it had started to blow and the crappy repair done by a previous owner could take no more. So off to the dealer who got one from Germany only to call me and say it's damaged and they were going to send it back. A drive up revealed that the damage was in fact the factory dent in the silencer, my initial ploy to get a huge discount failed unfortunately !